Barnyard Boogie Video Slot Guide & Review - Casino Answers! Barnyard Boogie is a 5-reel, 9-line video slot developed by Cryptologic, featuring a wild substitute symbol, scatter wins and a bonus game. 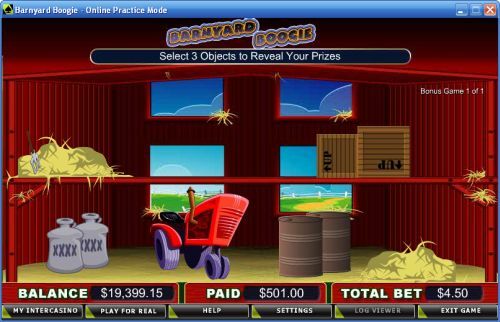 You can play the Barnyard Boogie video slot at [Americans: Unfortunately due to legal restrictions you are unable to play at any of the online casinos this game is at. We recommend you trying playing the unique slots at Win A Day Casino instead.]. Bets on the Barnyard Boogie slot machine are $0.05, $0.10, $0.15, $0.20, $0.25, $0.50, $0.75 and every denomination of $1 up to $20. You can select from 1-9 paylines on the Barnyard Boogie slot game. The minimum bet you can make is a nickel per spin up to the maximum total bet of $180. Barnyard Boogie has a very good betting range that is more than suitable for both low stakes, medium stakes or high stakes players. To play the Barnyard Boogie video slot, select your bet and press the “Spin” button. To play all 9 lines, you can also use the “Bet Max” button to spin the reels. The highest paying symbol on the Barnyard Boogie video slot is the Farmer symbol. If you land 5 Farmer symbols on an active payline, you will win the 4000 coin top jackpot. The Chicken is the second highest paying symbol on Barnyard Boogie, which pays up to 1500 coins. Other high paying symbols are the Tractor and Moonshine symbols, which both pay up to 750 coins when 5 symbols land on a payline. Hit these jackpots when you play Barnyard Boogie at [Americans: Unfortunately due to legal restrictions you are unable to play at any of the online casinos this game is at. We recommend you trying playing the unique slots at Win A Day Casino instead.]! The scatter symbol is the Barn on Barnyard Boogie. 2, 3, 4 or 5 Scattered Barn symbols will pay out 2X, 5X, 20X or 200X your total bet. The Pig symbol is wild on the Barnyard Boogie slot game. The Pig symbol will substitute for all symbols in Barnyard Boogie except for the Scattered Barn symbol. It only appears on reels 2 and 4, and when it appears on both at the same time, you will trigger the Barnyard Boogie bonus game. In the bonus game, you must find which objects the Dancing Pigs are hiding behind. For each one you find, you will win a prize! You can win up to 1000 coins in the Barnyard Boogie bonus game. Payouts are made according to the Paytable. Payline wins are multiplied by the bet per line. Scatter wins are multiplied by the total bet. Scatter wins are added to payline wins. Scatter wins are paid independent of the lines selected. All symbols pay left to right in consecutive order, except for the Scattered Barn (which pays any). Only the highest win on each selected payline is paid out. Coinciding wins on different paylines are added. The Pig wild symbol will substitute for all symbols except for the Scattered Barn. 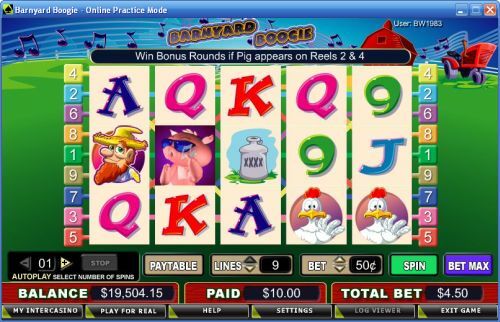 You can play up to 99 autoplay spins on the Barnyard Boogie online slot game. Simply select the number of autoplay spins you wish to play at the left of the game buttons. You can stop the autoplay mode at any time by pressing the “Stop” button. Barnyard Boogie has a fun theme that animal lovers (especially those who like pigs and other farm animals) will really enjoy. You can play the Barnyard Boogie video slot when you sign up and make a deposit at [Americans: Unfortunately due to legal restrictions you are unable to play at any of the online casinos this game is at. We recommend you trying playing the unique slots at Win A Day Casino instead.]! Are USA players able to play the Barnyard Boogie slot game for real money? No, Americans cannot play Barnyard Boogie for real money. Instead, you can read our Funky Chicken Video Slot Review, which is a very similar video slot. You can also play that video slot at Bovada. Where can I play a Barnyard Boogie flash game? Barnyard Boogie has a flash game that you can play by visiting the Instant Play casino at [Americans: Unfortunately due to legal restrictions you are unable to play at any of the online casinos this game is at. We recommend you trying playing the unique slots at Win A Day Casino instead.]. You can play for real money only. If you experience any issues with the flash casino, make sure you have the most recent version of Adobe Flash Player. How do I get to the Barnyard Boogie bonus game? The bonus game on Barnyard Boogie can only be triggered when the Pig symbol appears on both reels 2 and 4 at the same time.